Per Google guidelines, we can request our clients to place reviews about their experience working with us. SC Home Offer does not change, revise or manipulate any reviews. We may display snippets of a review on our website or elsewhere on the web. 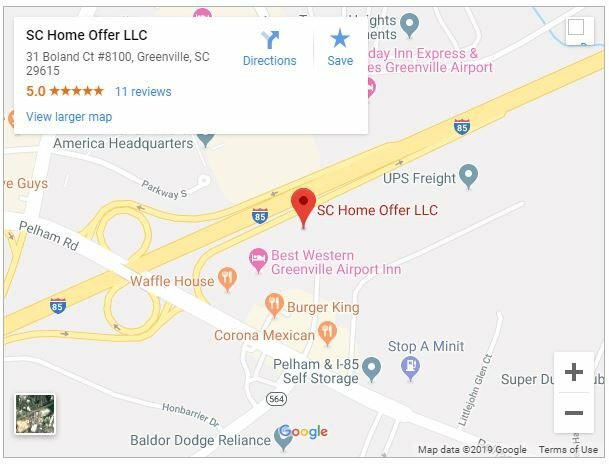 SC Home Offer does ask all of our clients to post valid reviews about their experience with us on Google, Bing, Birdeye, Yelp, Yellowpages, and the Better Business Bureau (BBB). Undoubtedly, it’s our clients’ decision if and where they place a review on any of these online sites. SC Home Offer enables our clients to leave reviews right here on our website as well. Want to share your own experience with SC Home Offer? Please leave your review below or contact us here. Dan went out of his way to make sure the process was smooth. Highly recommend. We purchased a home remolded by this company last October and they were a pleasure to work with. Dan went out of his way to make sure the process was smooth and that we were satisfied, even coming back at a later date to make sure things were done right. Highly recommend. Dan and his team were a pleasure to work with. Dan and his team were a pleasure to work with. They paid a fair price and followed through on buying my house in Pickens, even going above and beyond with it scheduling needs and the hour Dan had to wait at the lawyer’s office because we went to the wrong place. I can’t believe the deal I received working with Dan! Super helpful in getting my family into a home that went beyond what we wanted . I can’t believe the deal I received working with Dan. I cannot thank him enough for the help. We would like to thank the staff of SC Home Offer, LLC for the outstanding job they did for us. It was the right time for us to make a decision on selling our house and they made it happen. Daniel Ambrosio is one of the kindest gentlemen you will ever meet and he treated us with dignity and respect. His Christian values shined and we know God had led us in the right direction. You will never know how much we appreciate what you did for us. May God bless you and your staff!! There are still good people in this world. Dan and family are highly recommended. Thanks for beings a Godsend Dan! Dan was amazing, we were there every step of this adventure. I’m very hands-on, which is hard when your 4 hours away and he was patient, kind and worked hard to get me what I needed. Thanks for being a Godsend Dan! If it weren’t for Dan we wouldn’t have been able to buy the home we are in now. He’s a good person and understands what kind of help you need. He’ll be there when you need him. I am thankful every day that we had Dan to help us when we needed it most. We love you Dan. I enjoyed working with dan.he is honest and we had the easiest closing I have ever been to.i will tell anyone to trust him and do business with him and his company.